Suggestions for keeping drip edge w/ modular rectangular deck? and am hoping you Yurt folks can help me with a design question. 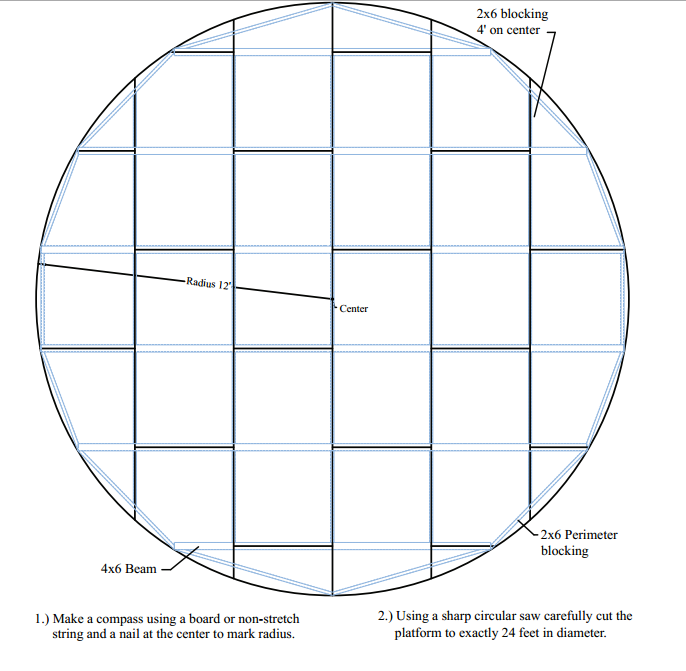 I've been trying to come up with a way to build a rectangular deck that the dome sits on. Originally I thought I'd just make a 32'x24' platform and make the first 24x24 a flat plywood surface, and then the last 8x24 deckwood. If I didn't have to worry about a drip edge, the dome would sit right on the plywood. My plan had been to lay down 2x6's stacked 2x thick on the plywood in the outline of the deck. That would allow the frame of the dome to sit off the surface and have the drip edge overhang correctly. The problem, of course, is that the water would just drip directly down onto the flat plywood, and may seep under the 2x6 and into the dome. This overall design is shown in the first image below. basically built a full deck topped w/ 2x6's for draining, then built a seperate platform on top for the yurt. The problem is that I'm going to have to move this thin in a year when I finish my PhD, so I want to come up w/ something that is as modular/easy to take apart and move as possible. 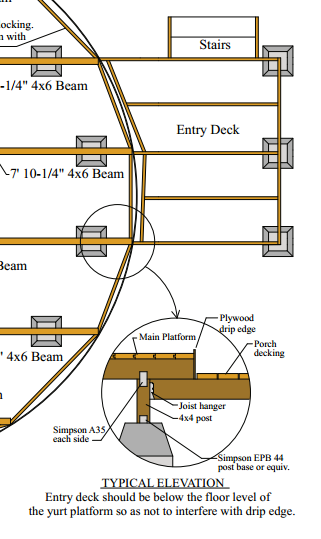 My current thought is to take advantage of the fact that the joists for the dome sit on top of the beams, and then just add some new joists on hangers off the same beam and build the deck on them. That way the dome would be elevated 6'' off the deck (actually a net of 4 inches, since the deck will be 2x6's). It seems like it will work, but I'd love your input and suggestions. Thanks so much! Re: Suggestions for keeping drip edge w/ modular rectangular deck? I'm a pro carpenter. Any on site stick built platform of that scale -not panelized and designed to be demounted- will be a major PITA to disassemble. You are talking a LOT of work. Think nomadic Mongolian here. Considering you'll be doing a major move in a year, I highly suggest you set up the yurt atop a cheap poly tarp layed out on a flattened site. Once the yurt is erected, tuck the edge of the tarp outside the yurt wall up under the cover, and snug down with the lowest tension band/rope. That will keep out the water for the next year. When you get a more permanent site, THEN build the yurt deck. IMO it sure wouldn't be worth the labor and expense to build a massive deck only to take it apart in a year. Not asked for, but for a cheap platform, prep an area flat and level as above. Spread out a gravel base. Lay pressure treated 4x4s in a grid on 2' centers. Then screw the 2x6 deck boards atop that grid at 90 degrees to the 4x4s. Atop that set another layer of 2x6 deck boards that get cut to the yurt footprint. 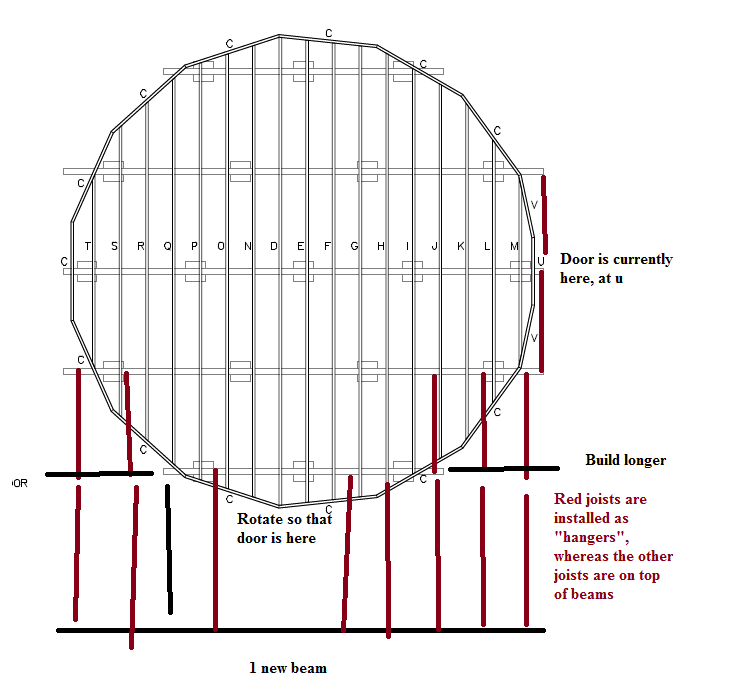 Install the decking, layout the yurt diameter, and cut the boards to the circle. Install the poly tarp as above, erect the yurt, etc. Add you floor covering. We're in a lower area so getting it up is going to have to be key. Plus, I've gotta make my better half happy, and I just don't think a tarp will do it Let's see. To me that seems like it would be a lot easier to take apart and put back together, and it should be plenty strong if I use 1'+ plywood considering that my Dome is lighter than a yurt. What do you think? Thank so much, Bob! That isn't portable. I'm being straight up with you here. 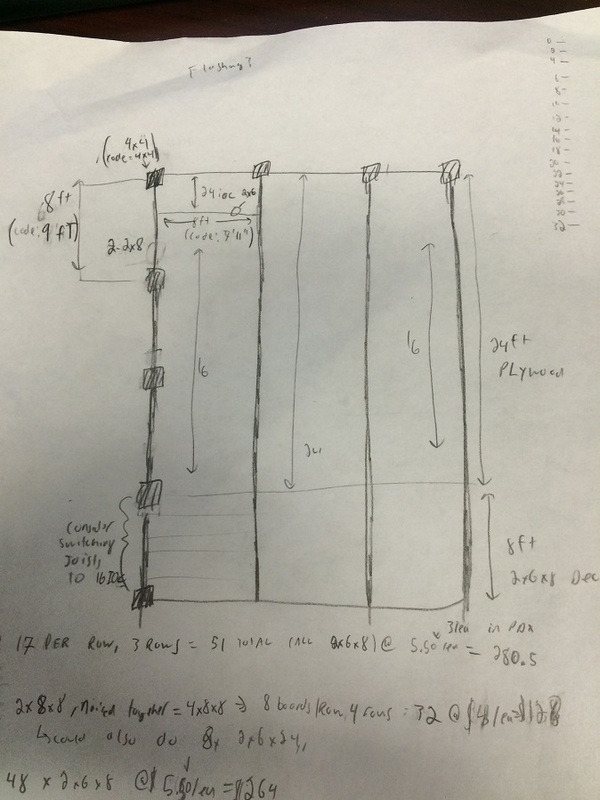 As far as the diagram, that platform requires lots of pieces parts. Cutting all the pieces parts and assembling into a bonafide platform takes a carpenter. Your diagram isn't portable. What is portable? Really, what I described in my first post insn't 'portable'. 4x8 panels that interloack into a platform is portable. You might want to check into that. JMO. Good luck. I have a similar situation--a yurt without a permanent location. Of course, that's half the point of a yurt, being movable. I'd agree thoroughly with Bob: a framed deck is going to be a pain to move, especially after just one year. It also costs a good deal in money and construction time (you're a Ph.D student, right?). I pondered what to do for a while (gravel base; lava rock+bricks+cinder blocks; etc). I can get you more details/sketches if you're interested. Last edited by hierony; 02-28-2015 at 05:53 AM. Also, from experience a rectangular deck with a circular 'building' on it is a recipe for water pooling and potential molding issues. But I think you realized that. I've seen some pictures of people using pallets to get a 'raised' platform. Cheap & portable, at least. Also, using bricks/cinderblocks as piers for plywood sheets that form the platform. Nomadic Mongolians have lived in gers for many centuries. I've read that they typically move three to four times a year. They literally move their 6 meter (average)yurt in a day or two with truck or van nowdays. FWIW, in the nomadic yurt vids and pics I've seen online the ground is left uncovered, or possibly covered with rugs. How accurate a statement that is I'm unsure. Unless you get first hand info it is just a guess. I've also seen on YT a video of young nomadic couple living in wet northern Europe, erect their yurt atop a poly tarp, as I detailed above. Apparently a tarp on the ground works for them. It is covered with rugs. They can also move their yurt in a day using a vehicle for transport. off the floor coverings, bugs from emerging into the yurt. If I had to pick between my present yurt-the one on the platform in the back yard- and another one set atop a tarp, I'd of course pick the one on the platform. Until I had to leave, that is. And that's the point of all of this. None of my ideas- gravel, 4x4s, boards etc. is nomadic. A tarp, now that IS nomadic.